How popular is the baby name Di in the United States right now? How popular was it historically? Find out using the graph below! Plus, check out all the blog posts that mention the name Di. On February 10, the Civil Registration Act went into effect in the Mexican state of Sonora (which is right across the border from Arizona). Article 46 of the act allows local authorities to reject baby names they deem derogatory, discriminatory, defamatory, libelous and meaningless, among other things. The state also banned 61 specific baby names, and will likely ban more names in the future. All of the banned names came directly from Sonora’s birth registries (meaning that each has been used at least once already). Facebook is the legal first name of at least 2 human beings at this point. Amazing. Hermione? I can see why Sonora would object to “Harry Potter” and “James Bond,” but Hermione by itself (as opposed to “Hermione Granger”) makes no sense. Hermione is a legitimate (and lovely) name that existed long before the Potter books. What are your thoughts? And, which name on the list above shocked you the most? 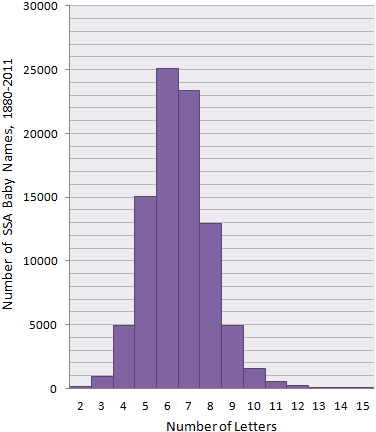 I introduced the baby name popularity graphs and a baby name directory (alphabetical) a few weeks ago. Some of the shortest names are Om, Io, Di and Ze. Some of the longest are Christopherryan, Laurenelizabeth, Christiandaniel and Mariadelrosario. And, just for fun, the graph below shows the length breakdown of all of the nearly 90,000 names that have ever appeared on an SSA list (1880-2011). The 6-letter names are winning, but the 7-letter names are not far behind. Hope you enjoy the new directory! Yesterday I discovered the “Asian Name Pronunciation Guide,” which was created by California State Polytechnic University (Pomona) to help its students “more accurately pronounce some common Asian first and last names.” What a cool thing for the school to make available. There are pages for names in Cambodian, Cantonese, Filipino, Indonesian, Japanese, Korean, Mandarin, Thai and Vietnamese. Best of all, most pages include audio files of native speakers correctly pronouncing selected names.